Well, it is finally here. The last day of my 28 Days of Kindness. For weeks I’ve been thinking about what I would do and write today. Should I go out with a bang? What will my final act of kindness be?? And then I realized…this is in no way my last act of kindness. While it has been a lot of work planning out each daily activity (and blogging about it), I feel like this project has really helped me learn that true kindness is simply being aware of others. It hit me full circle during a church service two weeks ago. The pastor was speaking about life lessons he would pass down to his daughter. All were good, but one stood out: Act boldly in regards to helping others. He told a story about his elementary school aged daughter who befriended a boy in her class. She was hesitant at first because he was the boy no one liked and she didn’t want to ostracize herself from her peers. However, she came to the decision that she would take a stand and be nice to him by saying hello to him every morning. Some time later she invited him to join her group of friends on the playground. Then, at the end of the year, she asked her dad if he would call this boy’s mother to see if he could come over to their house for a playdate. The pastor called the boy’s mother who wept because her 10-year-old son had never had a friend before. It’s sometimes hard to be kind. I cannot tell you how nervous I was leaving the flowers on my elderly neighbor’s doorstep. I didn’t want him to know it was me partly because I was a) embarrassed and didn’t want to seem “weird” and b) didn’t want him to think I pitied him. I squatted behind a privacy fence and between two trash cans for at least five minutes scouting the old guy’s house just to make sure he wasn’t by the window next to the porch (so much for not seeming weird, right?). The same goes for paying for the drive thru order of the car behind me at McDonald’s. After I paid for the order, I snatched my coffee and practically squealed out of the parking lot. Why? I have no idea. I think today’s act of kindness is very fitting for a finale. It was not grandiose and required little pre-planning. However, the idea behind it is key — even the most simple act can have a huge impact in brightening someone’s day. I’m completely addicted to Caitlin’s Healthy Tipping Point blog. She is also the creator behind the Operation Beautiful website which is essentially a movement of not only self-acceptance and seeing the beauty within, but, also, seeing the beauty in everyone. One Post-It at a time. Now, while Carrie Bradshaw may cringe at the Post-It, I happen to love them. Today, I jotted down a couple of messages and stuck them in random places I found myself. The one below was my favorite. It reads, “Hey Goodlookin’! You matter. You have worth. 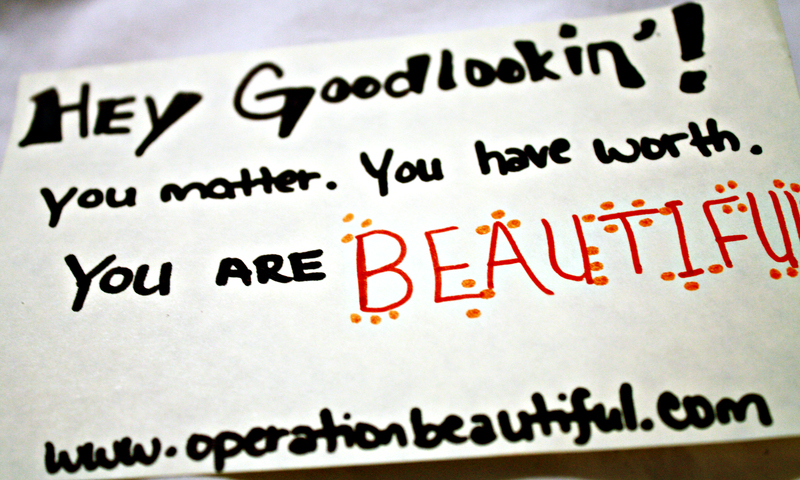 You are BEAUTIFUL!” This little baby is now sitting pretty on the bulletin board at Harris Teeter. And? It. Is. So. True. Mother Nature has been quite the tease lately. Those warm, Carolina blue sky days are becoming more and more frequent and I, for one, LOVE it! In anticipation for a beautiful, record-setting high day today, the boyfriend and I decided to tweak our usual weekend dog park ritual and, instead, take the little Stinker on a full-fledged hike. We toyed with the idea of going to Crowder’s Mountain, but decided instead to check out the trails at the US National Whitewater Center. While I have been to the USNWC on several occasions, I have never actually participated in any of the activities (minus drinking beer while watching kayak trials and/or bands). I was excited for our little leisurely stroll out in nature! 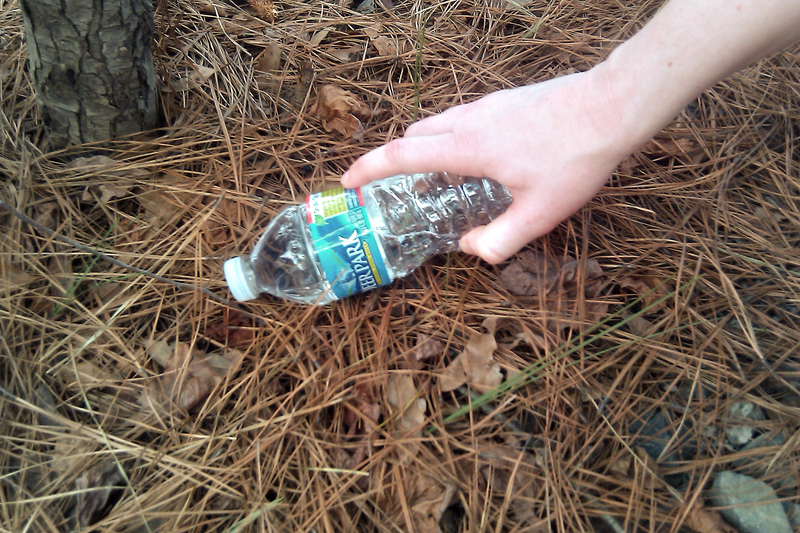 Plus, as today’s act of kindness, I decided to pick up any litter we passed along the trail (which actually wasn’t a ton…it’s so pretty and clean out there!). Leisurely stroll this was not. As it turns out, trying to stabilize yourself as you are tripping over roots and rocks is quite a workout for both your quads and abs. It wasn’t until after we had been meandering so long that we found ourselves ascending Goat Hill (a black diamond trail…EEK! ), that the boyfriend finally piped up with the possibility that we could be…ahem…lost. As we were doubling back to a fork the bf seemed to remember, I was lamenting on how we are “those” people and should just change our names to Hansel and Gretel. It was then that it hit me. Gasp…we were city slickers! I had failed my rural Tennessee heritage. It was then, without warning, I bit the dust. Well, technically, my hip and hand bit the dust. Luckily, no broken bones, just impending bruises (not excluding my ego). As we arrived at the fork (which was a wide, lush trail), we discovered that it was the emergency exit trail. After the briefest of pauses, we decided that my spill did warrant an emergency and it was there that we set off on the trail less traveled. While I have had my fair share of odd jobs (I consider myself to be the original Super Nanny), I am one of those rare people who has never waited tables. Quite frankly, I’ve always been too intimidated by the fast-paced restaurant biz to even give it a try. I know my limitations. For starters, my short-term memory leaves much to be desired. I have to write down everything. EVERYthing. (Do you wanna know how long my shower drain has been clogged because I keep forgetting to pick up the Draino? Yeah, no.) Secondly, I tend to have very little patience for the general public. Most importantly, I have seen Hell’s Kitchen. The chaos of a restaurant would absolutely send me over the edge. Give me a screaming toddler over a screaming adult anyday! I have a ginormous appreciation for those in the service industry. Especially those who do their jobs well (attentive and friendly, yet not a hoverer). I can’t imagine how difficult that is when you are constantly having to serve a-holes. Today, a co-worker and I went out to lunch at a local, family owned Korean restaurant. The food is good and the service is always great. To show my appreciation, I left an extra-large tip for our server – 50% (which actually wasn’t all that much considering lunch was less than $10 but, hey, it’s still a nice gesture!). 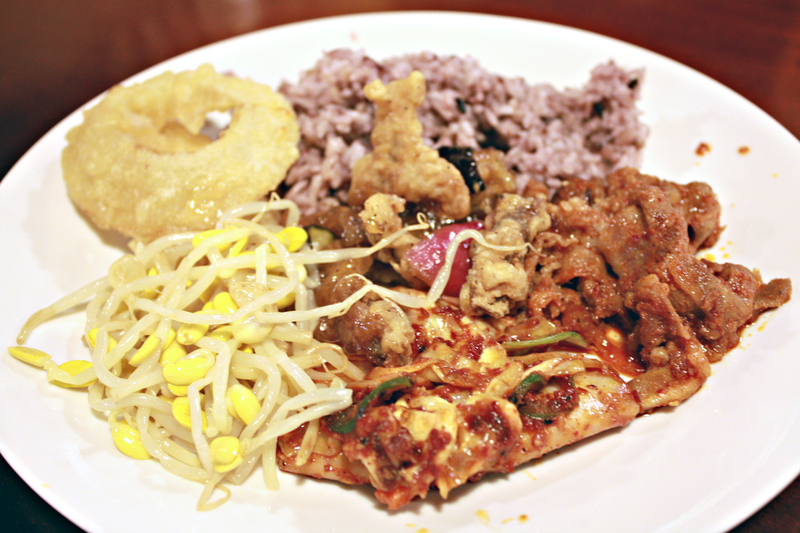 Korean food. It looks like innards, but actually tastes great! Day 6: Preeetty Bird. Preeetty Bird. Do you remember in the movie Mary Poppins when Mary sings (ever so slowly) about feeding the birds? All it takes is a tuppence from you. How painfully depressing was that song?! Geez, I needed a spoon full of sugar just to make it through the chorus. Today’s act of kindness is, literally, for the birds. 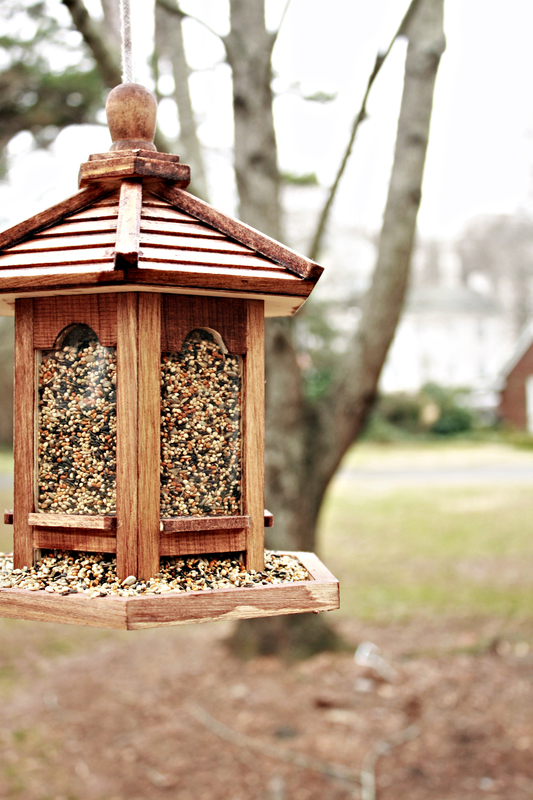 I got a little crafty this morning and stained a bird feeder I had picked up at the craft store. While I’m not sure if the feeder cost more than a tuppence, in American money, it was five bucks and change. The boyfriend and I did see some pretty swanky copper feeders at Home Depot when we were shopping for birdseed and twine, but I prefer the more shabby chic look of the one I had already purchased (This is what I tell myself when I see something I cannot afford. It usually works.). I have a lot of great intentions. Really, I do. In my head, my home would look perfectly put together and reminiscent of a Pottery Barn catalog — a marriage between understated elegance and alluring cozy. I would be able to shout “BEAT YOU TO IT!” as I pass one of those taunting billboards on the freeway asking if I want to be “high school skinny”. I would never miss a birthday, always be on time, and be so organized with my schedule that the act of juggling would not feel like juggling at all. I would not be easily irritated by strangers and would, most definitely, show more kindness and compassion to those in my everyday life. Every January 1, I tell myself that THIS will be the year that everything comes together. My house will become show worthy…along with my abs. I resolve to throw clutter and trans fats to the wind as I embark on a new, improved, more serene lifestyle! Then, inevitably, the first happy hour of the year rolls around and all bets are off. Let’s face it, you can’t have a happy hour without nibbles (preferably fried) and juicy gossip (Can I have that with a side of bitching, please?). And who wants to workout after a fun evening out? Not me, amigos. It’s time for me to face some basic facts about myself. One: I am lazy. Two: [Occasionally] I do not play well with others. Whether it is my co-worker with the chronically squeaky shoe, the woman who talks on her cellphone in the ladies’ room stall, or the guy in front of me at Jack In The Box who can’t decide on his order (GAHH! Just get the Jumbo Jack! ), I oftentimes find my blood pressure rising just by being in the remote vicinity of these…ahem….irritants. Enter 28 Day of Kindness. In my ever present quest for self-improvement, I have decided that 2011 will be the year that I chill the heck out. However, because I know myself (see basic facts one and two above), I will not be setting myself up for failure by making this a New Year’s resolution. No, I will pick one month for a kindness experiment. February seemed like a natural choice because of it’s connotation with Valentine’s Day, love and all that other mushy stuff. Essentially, everything that I’m trying to achieve. What’s even better? It is the shortest month of the year with only 28 days. Sold! I must do one kind deed per day. This can range from small, random acts of kindness to more grandiose, planned acts. I will not verbalize any snarky or unkind remarks throughout the entire experiment. Disclaimer: The only exceptions will be comments about certain co-workers and the entire cast of The Bachelor. I toyed with the decision on whether to chronicle my “journey” (shout out to all my fellow Bachelor fans!). I do think good deeds are best when done anonymously. However, my lazy self will definitely benefit from the accountability this blog will provide. It’s like being in a group fitness class at the gym — I may be about to die of exertion, but there’s no way that I’m going to be the Fatty Patty that quits in front of everyone and leaves class early! More importantly, I aim to inspire. I can’t be the only person who spends a good portion of my existence simply going through the motions of my over-extended days. How many times during the day do we miss an opportunity to brighten someone else’s? Hopefully, you will read about a minuscule, yet kind thing I do and think to yourself, “Oh snap, that’s pretty easy. I could do that, too!” Before you know it violent crime will be only a legend and we will all be pooping rainbows and dreaming in cartoon (another shout out to my fellow Bachelor fans!). No, no….eradicating violent crime and 32-bit color dreams is not my intent. However, I see nothing but good coming from a potential outbreak of the warm fuzzies. Look out world…you’re about to get niced! At least for the next 28 days.